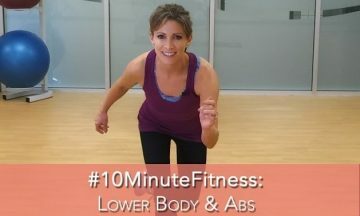 Need a quick, 10 minute workout for your lower body and abs? Do this workout with me and feel your lower body and abs burn! Just remember… you can’t “just” work out your abs and expect to get a six pack! It takes whole body conditioning and the right dietary lifestyle to have a nice toned belly. Keep working on it… you can do it! Want to go ahead and get started on a whole body workout? Check out the rest of the #10MinuteFitness playlist and double or triple up for your total body session! Thanks to Jacksonville University for use of their amazing gym for filming. What a great facility! Do you have any requests for workouts? Be sure to connect with me on your favorite social media sites: Facebook (Shannon Miller Official), Twitter (@ShannonMiller96), Instagram (@ShannonMiller96), and Pinterest(@ShannonMiller96). Also, for more workouts, check out my other fitness videos on Youtube.